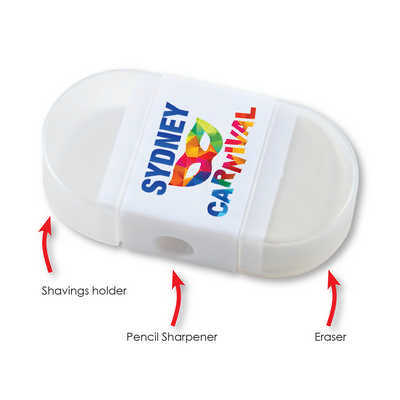 2 in 1 pencil sharpener / eraser. Pull cap for clean disposal of pencil shavings. Colours - White Size - 34mmL x 64mmH x 17mmD Decoration Area(s) - Pad Print : Side/s - Rectangle 28mmL x 21mmH; 4CP Digital Direct Print : Side/s - Rectangle 28mmL x 21mmH. Price includes : 1 Col 1 Pos Print. Setup is included.